Ashlee and Kyle married in the late summer on the shores of Lake Tahoe. 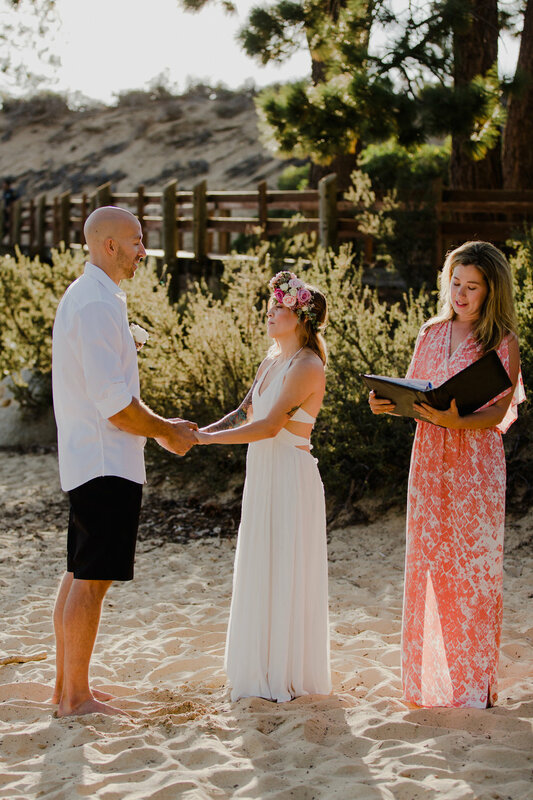 They wanted a no-fuss wedding with their toes in the sand surrounded by just their closest family and friends so they could have the moment to completely focus on each other. Underwood Photography captured all of the beautiful images shared from this most special day. Just about 6 weeks prior to the wedding, Ashlee reached out to me, one day after Kyle proposed. I was so delighted and honored to be asked to officiate their intimate ceremony at Lake Tahoe. For me, this was a momentous wedding, as I had just moved back to the Tahoe region and this was my first booking on my home turf. (For those who don't know, I grew up in Tahoe and had just moved back after about 15 years away). The ceremony began about an hour before sunset with the backside of the stage as a beautiful backdrop on one side, and with Tahoe on the other. The evening was warm and balmy, while the water was pure glass. It truly could not have been a more beautiful evening. Ashlee and Kyle met through friends and had been best friends for about a year before they became a couple. Ashlee is a yoga teacher including paddle board yoga on Lake Tahoe. Both Ashlee and Kyle are devoted yogis and enjoy meditating together. 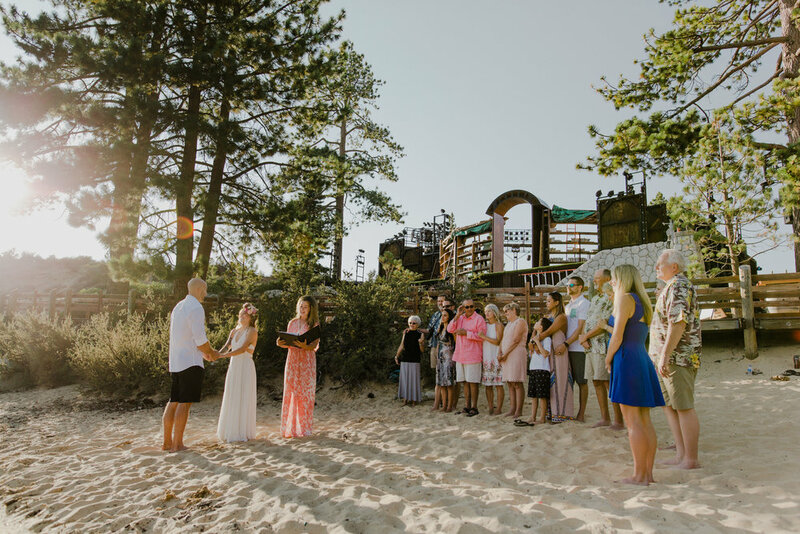 Sand Harbor is where Ashlee and Kyle spend most of the free time in the warm months and it just seemed so fitting to them that they exchange their vows at their favorite beautiful setting. 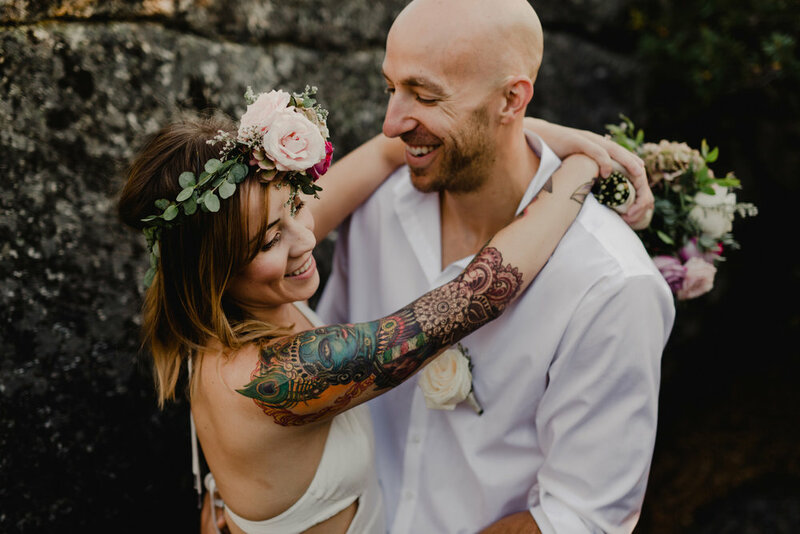 The energetic connection between this gorgeous couple was so apparent and to lead them through their ceremony as they celebrated this monumental step as a couple was such an honor. Their vows and personal ceremony was so full of love and gratitude for one another, it lights me up just thinking about it. Ashlee's cool bohemian style was so perfect for their natural laid back styles. She looked like a goddess in her Free People dress and I loved the style of her flower crown from Petal to the Metal. It was truly so special to have been part of Ashlee and Kyle's Lake Tahoe wedding, I wish them all the happiness in the world :) Hopefully next summer I'll get on a paddle board and be one of Ashlee's SUP yoga students!